Our MySQL Tests allow you to experience an online examination in the real-time environment. In every online test on MySQL, you will be presented with Multiple Choice Questions (MCQs) which will test your skills in MySQL Concepts in a detailed and comprehensive manner. In the test, each question will have 4 options to choose from. You should select only 1 correct option as an answer and then move on to the next question. Once you submit answers to all the questions, you will be given your final test score. In the Online MySQL Test, for every correct answer, you will be given 2 points. There will also be negative marking of -1 for every wrong answer. So, you will have to be more careful in choosing the answers to the question in your online examination. If needed, you should skip to the next question and come back to the previous question later so that you can do proper time management for the online mock tests. 1. "MySQL Practice Tests" - In MySQL practice tests, there will be a series of practice tests wherein you can test your MySQL concepts on every chapter separately. There will not be any time limit on these tests. So, MySQL Practice Tests should be the first set of tests which you should attempt. Goto these practice tests here. 2. "MySQL Mock Tests" - In MySQL mock tests, there will be a series of mock tests wherein you can test your MySQL concepts on every chapter separately, but there will be a fixed time limit per test. So, it is similar to MySQL Practice Tests, but with an added constraint of time limits. 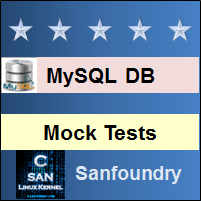 You should try MySQL Mock Tests if you are appearing for any online examination soon. Goto these mock tests here. 3. "MySQL Certification Test" - Once you are through with your MySQL concepts, then you should try our MySQL Certification Test wherein Sanfoundry will issue a free Certificate to you if you scored either Grade A* or Grade A in MySQL Certification Test. Goto MySQL Certification test here. 4. 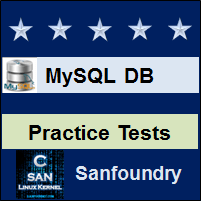 "MySQL Internship Test" - If you are interested to do Internships in MySQL at Sanfoundry, then you must take our MySQL Internship Test. If you scored either Grade A* or Grade A in MySQL Internship Test, then you are eligible for Internship at Sanfoundry in MySQL. Goto MySQL Internship test here. 5. 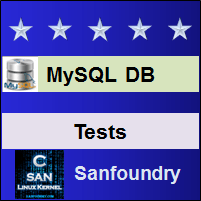 "MySQL Job Test" - If you are a fresher, a dropout, an experienced person and if you know MySQL well and looking out for jobs in MySQL domain at Sanfoundry (or our Network of Companies), then you should try and qualify our "MySQL Job Test". 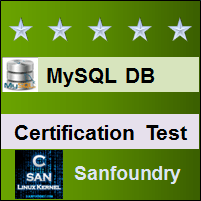 If you scored either Grade A* or Grade A in MySQL Job Test, then you are eligible for a Job at Sanfoundry (or our Network) in MySQL domain. Goto MySQL Job test here. For every "MySQL Practice Test", Total Questions: 20, Total Time: Unlimited. For every "MySQL Mock Test", Total Questions: 20, Total Time: 20 Minutes. For "MySQL Certification Test", Total Questions: 50, Total Time: 1 hour. For "MySQL Internship Test", Total Questions: 50, Total Time: 1 hour. For "MySQL Job Test", Total Questions: 50, Total Time: 1 hour. Before you get started on these series of online tests on MySQL, you should learn, study and practice our collection of 1000 MCQs (Multiple Choice Questions and Answers) on MySQL here. We also prefer that you should practice MySQL practice tests and mock tests completely before attempting the certification test. Here is the list of online practice tests and mock tests on MySQL. Each online test focuses on a "Specific chapter of MySQL". So, you should try both practice test and mock test on every chapter to do a self-assessment of your knowledge (along with time-limit constraints) in every area or sub-topic of MySQL. MySQL Certification test, Internship test, and Job Test are mentioned at the end of this list. 1. MySQL Test 1 – This set of online test on “MySQL” tests your skills on Basic Database Terminology, MySQL Setup – 1, MySQL Setup – 2, Interacting with MySQL, Server SQL Mode, MySQL Identifier Syntax and Naming Rules, Case Sensitivity in SQL Statements, Character Set Support, Selecting, Creating, Dropping and Altering Databases, Creating, Dropping, Indexing and Altering Tables, Obtaining Database Metadata, Performing Multiple – Table Retrievals with Joins, Performing Multiple – Table Retrievals with Subqueries. 2. MySQL Test 2 – This set of online test on “MySQL” tests your skills on Performing Multiple – Table Retrievals with Union, Using Views, Multiple – Table Deletes and Updates, Performing Transactions, Foreign Keys and Referential Integrity, Using Full Text Searches, Using MySQL Command Line Tool, Table Creation, Populating and Modifying Tables – 1, Populating and Modifying Tables – 2, Populating and Modifying Tables – 3, Data Value Categories – 1, Data Value Categories – 2. 3. MySQL Test 3 – This set of online test on “MySQL” tests your skills on MySQL Datatypes – 1, MySQL Datatypes – 2, MySQL Datatypes – 3, MySQL Datatypes – 4, MySQL Datatypes – 5, How MySQL Handles Invalid Data Values, Working with Sequences, Expression Evaluation and Type Conversion, Choosing Data Types, Compound Statements and Statement Delimiters, Stored Functions and Procedures, Triggers, Events. 4. MySQL Test 4 – This set of online test on “MySQL” tests your skills on Security for Stored Programs and Views, Using Indexing, MySQL Query Optimizer, Choosing Data Types for Efficient Queries, Loading Data Efficiently, Scheduling and Locking Issues, Administrative-Level Optimizations, When Good Statements Go Bad, Query Mechanics, Query Clauses, MySQL Programs, APIs Available for MySQL, Choosing an API. 5. MySQL Test 5 – This set of online test on “MySQL” tests your skills on Compiling and Linking Client Programs, Connecting to the Server, Handling Errors and Processing Command Options, Processing SQL Statements, Writing Clients That Include SSL Support, Using the Embedded Server Library, Using Multiple-Statement Execution, Using Server-Side Prepared Statements, Perl Script Characteristics, Perl DBI Overview – 1, Perl DBI Overview – 2, Putting Perl DBI to Work, Using Perl DBI in Web Applications. 6. MySQL Test 6 – This set of online test on “MySQL” tests your skills on PHP Overview, Putting PHP to Work, MySQL Components, General MySQL Administration, Access Control and Security, Database Maintenance, Backups and Replication, Location of the Data Directory, Structure of the Data Directory, Relocating Data Directory Contents, Securing a New MySQL Installation, Arranging for MySQL Server Startup and Shutdown, Controlling How the Server Listens for Connections. 7. MySQL Test 7 – This set of online test on “MySQL” tests your skills on Managing MySQL User Accounts, Maintaining Logs, Tuning the Server, Storage Engine Configuration, Enabling or Disabling Local Capability for Load Data, Internationalization and Localization Issues, Running Multiple Servers, Updating MySQL, Internal Security: Preventing Unauthorized Filesystem Access, External Security: Preventing Unauthorized Network Access, Setting Up Secure Connections, Principles of Preventive Maintenance. 8. MySQL Test 8 – This set of online test on “MySQL” tests your skills on Performing Database Maintenance with the Server Running, General Preventative Maintenance, Making Database Backups, Copying Databases to Another Server, Checking and Repairing Database Tables, Using Backups for Data Recovery, Setting Up Replication Servers, Numeric Data Types, String Data Types, Date and Time Data Types, Spatial Data Types, Operators. 9. MySQL Test 9 – This set of online test on “MySQL” tests your skills on Functions, System Variables, Session-Only System Variables, Status Variables, User-Defined Variables, SQL Statement Syntax (Non-Compound Statements), Compound Statement Syntax, Comment Syntax, The Select Clauses – 1, The Select Clauses – 2, The From Clauses – 1, The From Clauses – 2. 10. MySQL Test 10 – This set of online test on “MySQL” tests your skills on The Where Clauses, The group by and having Clause, The Order by Clauses – 1, The Order by Clauses – 2, Conditional Evaluation, Condition Types – 1, Condition Types – 2, Condition Types – 3, Condition Types – 4, Null: The Four Letter Word, Database Copies, Secure Connections. 11. MySQL Certification Test - This set of online free certification test on "MySQL" tests your skills on all areas (all chapters, topics and subtopics) of MySQL. 12. 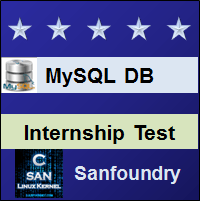 MySQL Internship Test - If you scored either Grade A* or Grade A in our MySQL Internship Test, then you can apply for Internship at Sanfoundry in MySQL. 13. 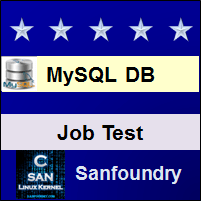 MySQL Job Test - If you scored either Grade A* or Grade A in our MySQL Job Test, then you can apply for Jobs at Sanfoundry in MySQL domain. Best Wishes for your MySQL Tests!